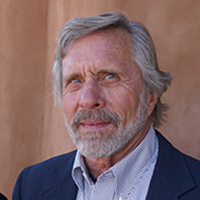 Commissioner John Rohovec is a native New Mexican who is active in the vibrant Silver City art scene. He and his artist partner, Linda Brewer, a ceramic sculptor, own and manage the Blue Dome Gallery. Rohovec has served on the Board of Directors of the Mimbres Region Arts Council. He came to art not as an artist (he describes himself as a monochromatic muralist, that is, he paints walls) nor as a patron of the arts, but as someone who has appreciated art from his youth. Today, he likes contemporary nonrepresentational art and all kinds of ceramics.